The American College of Greece | Congratulations Class of 2013! Home » News & Events » News » Congratulations Class of 2013! Cheered on by thousands of parents and friends, almost 500 young men and women celebrated their graduation from DEREE – The American College of Greece during the majestic annual commencement ceremony which was held on Saturday, June 29, at the stadium of The American College of Greece in Agia Paraskevi. During the ceremony, George Logothetis, president of the global Libra Group, received an honorary doctorate from the American College of Greece. Mr. Logothetis was honored for his support for the Libra Internship Program at the American College of Greece, which offers dozens of students each year the opportunity to gain experience at one of Libra’s subsidiaries around the globe. Many of those interns are also subsidized by Libra to engage in study modules at U.S. universities who have partnership agreements with DEREE-ACG. Mr. Logothetis was also honored for his support toward other educational institutions, public and private, in Greece and toward young Greek entrepreneurs. In a moving and highly effective speech, Mr. Logothetis urged the graduates not to limit their ambition to material goals, telling them that the surest path to success is though duty and honor. He also warned about the dangers of hubris: "I caution you to be very careful when things go right – always keep your feet on the ground and ensure hubris always gives way to humility. History is littered with successful people undone by hubris." Finally, Mr. Logothetis told the cheering graduates that in life "nothing of real value or true worth is, or should be, either easy or free. It requires struggle, effort, commitment and conviction." The graduates received their bachelor’s and master’s degrees from the hands of the President of the American College of Greece, Dr. David G. Horner. This year, for the first time, some of the graduates also received validated awards from the Open University of the United Kingdom, with which the DEREE has signed a wide-ranging cooperation agreement. 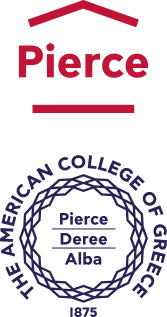 DEREE-ACG is accredited by the New England Association of Schools and Colleges, the oldest and most prestigious accreditation organization in the U.S.
Commencement 2013 was attended by officers and members of the Greek Parliament, ministers, ambassadors of foreign nations, as well as representatives of local governments and the business world.